Though deeply personal (most of the book deals with correcting history and the memory of the author’s grandfather–a key player in the Treblinka Revolt) and at times impassioned, this is still an academic book. 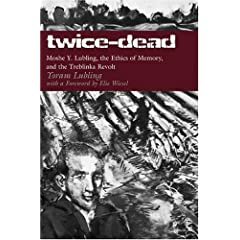 “Twice Dead” is meticulously researched and documented, and its heady philosophical ideas are argued and counter argued in an annotated style that will make it a rather dry read for the casual audience. However, for the student of philosophy or history, it makes for a great read. It is also of special note for those studying the Holocaust because of its foreword by Elie Wiesel, an expert in the field who doesn’t lend his name to things lightly. “Twice Dead” refers to the idea that many Holocaust victims were murdered twice: once by the Nazis, and a second time by the generations that forgot them. Lubling touches on many subjects: the psychology of Holocaust studies, the ethics of memory, revisionist history, anti-intellectualism, postmodernism, and unreliability of eyewitness accounts, modern Zionism, and the radical Islamic movement. He ends his studies with a chilling visit to Poland and Treblinka visiting the actual spots where his family and countless others were murdered. While I attended Elon University, I took two courses taught by Yoram Lubling on Martin Buber and Frederick Nietzsche. Reading this book brought back fond memories of the debates and lectures from the intimate classroom setting where Lubling captivated (and I imagine still captivates) his students with his quiet rage and conversational style that provokes as much as it enlightens. Those with vested personal interests in the topics discussed in “Twice Dead” will find much food for thought. This entry was posted in Book Reviews, Books, History and tagged Elon University, Holocaust, Moshe Y. Yubling, Philosophy, Twice Dead, Yoram Yubling.